Staying plugged in to social media outlets has become a norm in today’s society. There’s no doubt that social media has its perks but it undoubtedly also has its pitfalls. Keeping up to date with news, friends and trends helps us to feel connected in a modern 2017 world. However, there are certain aspects to social media that aren’t so great; “normal” body portrayals being one of them. Body image can be complex and altered by different physiological changes such as hormonal fluctuations relating to pregnancy. Body image refers to “an individual’s feelings, attitudes, and evaluations of his or her body including various aspects of the body (e.g., shape, weight, ability) as well as the body as a whole.”3 Maintaining a healthy and positive body image is hard enough without having to see idealistic images plastered all over social media. It becomes even harder when overloaded with unrealistic images. Women may be even more prone to setting unrealistic body goals during the time after giving birth. If this is your first child you may be expecting to bounce back right away, with media fostering this message. But how each woman’s body responds after birth is specific to each individual woman. How do the women view media portrayals of the perinatal period? How do women perceive the media to impact their body image? Although media depictions of the perfect figure may create aspirational images of the ideal postpartum body, you should listen to your body and foster healthy, positive lifestyle choices. It’s important that you stay healthy and happy for your new baby and for yourself. You can choose to let what you see shape how you live your life and the lifestyle choices you make or you can listen to your body and foster healthy and happy choices. It is important not only to ensure your baby is adequately taken care of, but also yourself. Remember ladies, pregnancy and childbirth is an incredibly special and fleeting period of time. So, treasure this special time, bond with your newborn, and embrace the pregnancy body you have. Every curve tells a story of the journey that brought your bundle of joy into the world, and should be cherished! REFERENCES: 1. Toni Liechty, Sarah M. Coyne, Kevin M. Collier, Aubrey D. Sharp. 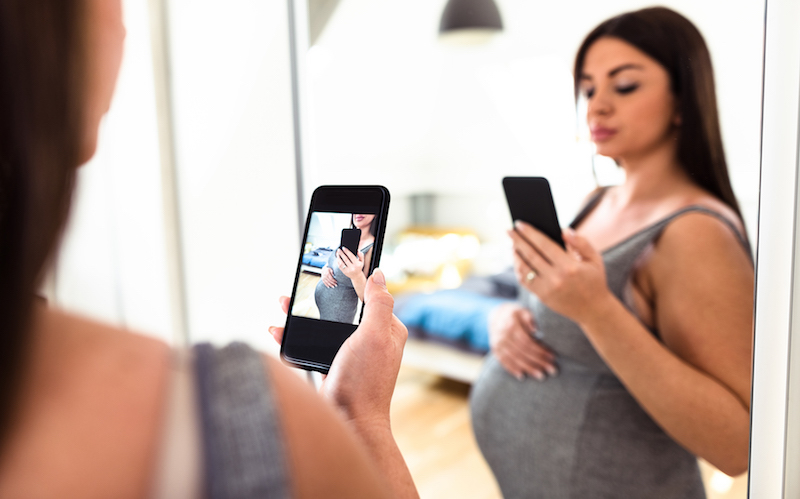 “It’s Just Not Very Realistic”: Perceptions of Media Among Pregnant and Postpartum Women. Health Communication, 2017; 1 DOI: 10.1080/10410236.2017.1315680. 2. University of Illinois at Urbana-Champaign. “Media portrayals of pregnant women, new moms unrealistic.” ScienceDaily. ScienceDaily, 7 August 2017. www.sciencedaily.com/releases/2017/08/170807152604.html. 3. Grogan, S. (2016). Body image: Understanding body dissatisfaction in men, women, and children. New York, NY: Routledge.